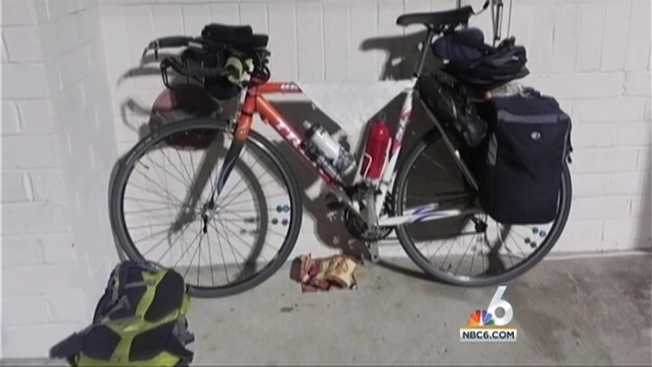 Police say a Connecticut man who was biking from Maryland to Miami to propose to his girlfriend was fatally stabbed by a homeless man outside a McDonald's restaurant. The Vero Beach News Journal reports that 28-year-old Kevin Adorno stopped at the restaurant Monday night and was talking to his girlfriend on a cellphone when he was attacked. Witnesses say Adorno stumbled into the restaurant. One person started administering aid while another called 911. He was pronounced dead a short time later. Officers arrested 59-year-old Rene Herrera Cruz at a Burger King across the street. He is charged with first-degree murder. Cruz told police he was in the parking lot when a motorcycle pulled up near him. According to the arrest affidavit, "Cruz had felt as if people kept watching him" so he walked away and took a filet knife from his backpack. He told police Adorno was sitting in the restaurant looking at him. When Adorno went outside to use his cellphone, Cruz thought Adorno was taking pictures of him and "directing people to go after him," according to the affidavit. As Adorno approached, Cruz pulled out the knife and slashed him, the affidavit said. Cruz was being held without bond at the Indian River County Jail Wednesday, records showed. It was unknown if he has an attorney. The engagement ring Adorno was planning to give his girlfriend was found by officers, the report said. Police Chief David Currey says the trip was a "bucket list" item for Adorno. He had started the ride last month and was about 100 miles away from finishing his ride. Family members said Adorno, an athlete and animal lover who owned a graphic design company, biked from Maine to Maryland with his sister last summer. UpdatedSlain Journalist Sotloff's Family: "His Spirit Will Endure"